No-where is sole-gripping design more critical than on stairs, where feet are more prone to slip, often with severe consequences. Heavy Duty Diamond stair treads provide the sole-gripping qualities of Heavy Duty safety grating for extra safety in two ways: multi-directional scraping action of tiny-toothed surfaces keeps shoes clean; open design rids surface of debris. The open area also makes threads easy to see, and edges read well from above. Heavy Duty Diamond stair treads are available in standard nosing style only, 10-gauge steel: one depth (2”), two widths (91/4”, 133/4”), and four standard spans (24”, 30”, 36”, 48”), with others available upon request. 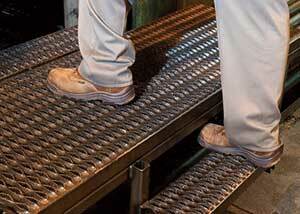 Ideal for new construction, or easily attached to stringers for rehabilitation of existing stairs. Contact Marco Specialty Steel to learn more about our extensive selection of stock and custom Heavy Duty Diamond Stair Treads products and to receive a no-obligation quote.